A tattoo can look amazing on your skin but what if you don’t want it anymore, or what if the job gets horribly bad. Well, laser tattoo removal Dubai has just the solution for you. Keep reading to find out more. Tattoos are very common these days. A very common perception about tattoos is they are always thought as permanent a non removable but with the advancement in science has now made it possible to disappear your tattoo forever. You can now remove an embarrassing tattoo from your teens or just remove one to make space for a new one. The most effective remedy for removing tattoos is laser tattoo removal Dubai. Laser is the most effective way for removing your tattoo. The whole procedure is very effective and is carried out just in a matter of time. Laser is project on the area of the body containing tattoo and is moved depending upon the shape of the tattoo. A laser therapy works by projecting the laser on the skin which later breaks the ink particles breaking the larger tattoo into a smaller one. Some fragments of the ink still remain in the skin but then after performing such sessions again they are removed from the skin. The physically fractured tattoo particles are removed by the skin after sometime. 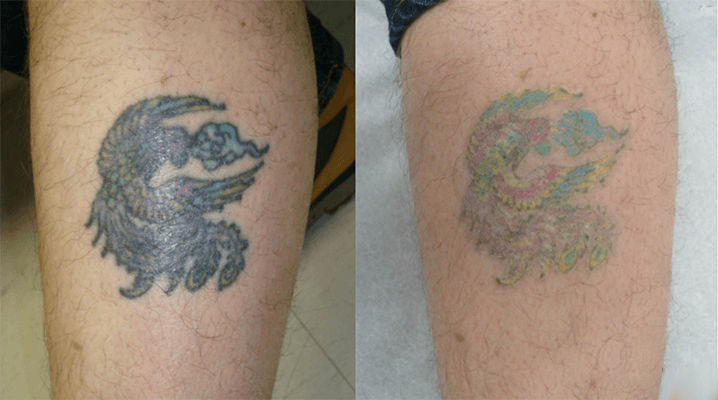 Your tattoo removal process depends upon the artist who gave you the tattoo. It depends upon the colors and ink type used. If the colors are dark and bright it would take more time for its removal. Lighter tattoos are easy to remove than darker ones. If you have an embarrassing tattoo or a tattoo which you want to get re done it’s not important to remove the whole tattoo. You can just remove the part which went wrong. It would save a lot of effort and then later you can get that tattoo redone. There can be more than one session involved in the whole activity. The removal can lead to blisters or scars. Which can create problems and irritation. A whole tattoo usually takes more than 7-8 sessions to completely disappear. There can be some side-effects as well of this procedure. The procedure can lead to pigmentation and scars. It can cause redness on the skin in some cases as well. The treatment may help you in getting rid of the unwanted tattoo but there are some potential side-effects as well. This can cause skin irritation. Laser tattoo removal Dubai use laser to remove your unwanted tattoo. The whole procedure is done under great care and precession. The procedure is not that much painful but it can sting a bit. But removing a tattoo is now easier than getting one thanks to Laser. It was always thought that tattoos are permanent and you have to stick by what you get in your teens forever. But thanks to laser you can now get rid of it in no time. That too with a painless procedure. Make a call today at Laser Tattoo Removal Dubai and know more about your skin and Tattoos and their removal. Tip: Also read the related article no one tell the tattoo removal process. You Don't want to Miss Our Offer on Laser Tattoo Removal . Fill in The Form To Avail Our Special Offer For You!